The Printer Shop - Repairs on HP, Lexmark, Canon, Brother and most major brands. 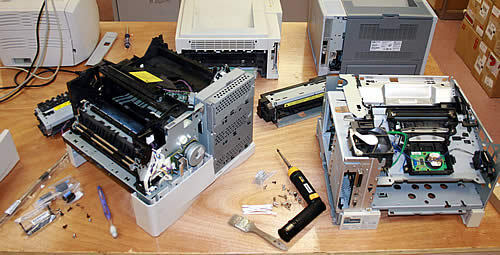 The Printer Shop has over 10 years experience in printer repair and small office machine repair. We also carry older hard to find printers, supplies and accessories for home owners and small business owners. We can come to your office or you can bring your printer into our facility. Convenience and customer satisfaction is our number one priority. We are able to send our technicians on-site for printers that are too big or bulky to be transported. On-site repair is no extra expense. The Printer Shop has a flat rate program so that the customer always knows the cost. There are no trip charges and no night and weekend rates. We do have a $10.00 diagnostic fee that we charge but will be used toward the cost of repair. The Printer Shop will always give the customer an estimate prior to any repair. We believe that the customer should have the choice to repair or not. We offer a recycle program for customers that would rather not incur the expense of repair. We also have a trade-in program for those who would like to upgrade their current unit. Contact us today at (316)722-4400 or e-mail at liz@theprintershop.net.